Home DIY Cooking On A Budget Cooking On A Budget: Aloha Chicken Kebabs! 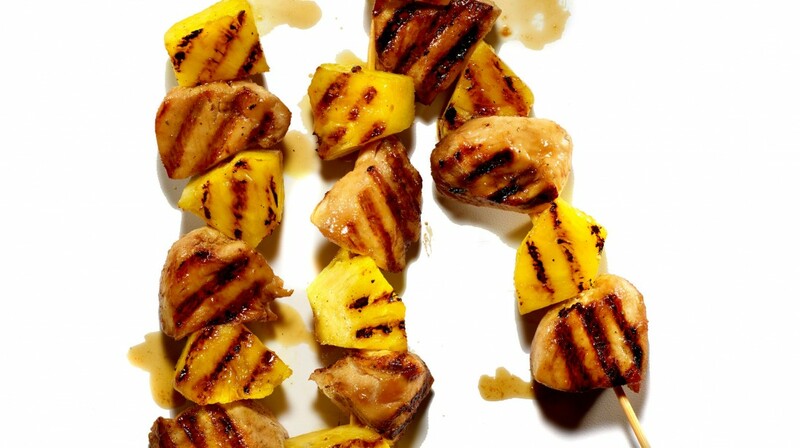 Cooking On A Budget: Aloha Chicken Kebabs! If you love hosting summer picnics, cookouts, or barbecues right in your back yard, you know that offering delicious foods to your guests is a must! There are so many delicious summer recipes out there, it can be hard to select just a few. Today, we are sharing a super delicious and affordable recipe for Aloha Chicken Kebabs! These delicious chicken kebobs combine flavors that results in a savory meal. Give this recipe a try at your next family picnic or cookout. Whisk together the ketchup, brown sugar, soy sauce, pineapple juice, 2 tablespoons of olive oil, rice vinegar, minced garlic, ginger, and sesame oil. Add in 3/4 teaspoon of ground pepper and add salt to taste. Reserve 1/2 cup of the mixture. Pour the remaining marinade into a plastic bag or bowl and add in the chicken that has been chopped into cubes. Marinade the chicken for approximately 1 to 2 hours. While the chicken is marinating in the refrigerator, soak the kebob skewers in water for one hour. When your chicken is close to being done marinating, turn on your grill so that it reaches approximately 400 degrees Fahrenheit. Next, drizzle the remaining 2 tablespoons of olive oil over the red onion, bell pepper, and pineapple and toss together. Season with salt and pepper, then begin to place the onions, peppers, and marinated chicken cubes on the skewers. Brush some olive oil onto the grill grates before placing the kebobs on the grill. Grill the kebobs for approximately 5 minutes and then brush the reserved marinade. Rotate, and brush the other side with the marinade. The skewers are finished cooking when the chicken reaches an internal temperature of 165 degrees Fahrenheit. Enjoy the kebobs warm!